If you have questions, please see if your answer is listed here, otherwise please contact me and I will be happy to answer any of your questions. You’ll see my list of tools and resources below too! I don't know what I need to do to get started? That’s alright, we know how difficult it is to understand all the steps. We can help you from start to finish. You don’t have to learn anything or research your next move. Just contact us and we will help you with all the steps needed. A domain name is your address on the Internet. Your ‘www’ is the address where your website is found on the ‘world-wide web’. It is also referred to as your URL – Universal Resource Locator. No two websites have the same URL. They may have the same name, but not the TLD – Top Level Domain. (The TLD is the .com, .net, .org etc.) They are all unique. Every website that is to be accessed by people browsing on the Internet, requires web hosting. The web hosting companies look after your piece of real estate…your domain. Without a webhost, you can’t have a visible website on the ‘world wide web’. WordPress is the most popular content management system used by web designers and bloggers on the Internet today. It is a platform that is used by individuals and big companies and everyone between. I have written an article here on 7 Reasons To Use WordPress. Here are a few reasons why it is an excellent choice for building a website on. You don’t need to be a qualified web designer to manage your website proficiently. You also don’t need to know any HTML or code. You can also add content whenever you wish. Plus as an added feature you can have your readers interact with you, by allowing them to comment on your pages. These are just some of the features that make it so desirable for any business owner or individual, web designer, programmer or publisher to want to use WordPress. Are there ongoing fees to having a website? Once your website is completed there are no more web design fees. There are however, web hosting and domain registration fees. Your website needs to be hosted for it to be visible on the web. You have to pay ‘rent’ for your place in ‘cyber-space’. 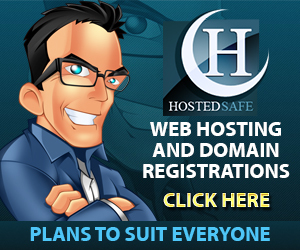 These fees are paid either monthly, quarterly or yearly to a hosting company, such as HostedSafe Web Hosting. Our sister company, HostedSafe has varying monthly fees depending on your requirements. Typically this is about $15 per month. You also have to pay for your domain name to remain registered. Just like a yearly vehicle registration, so to is your domain registration. This fee is approx. $30 per year. You may find cheaper prices elsewhere, but Geoff O’Dea is on call 24 hours a day, 7 days a week. His one-on-one service is worth more than what he charges. Plus, your website is hosted on an extremely fast server, so your pages load fast! The only other optional fees is if you would like us to help you manage your site, but this is not a necessity or requirement. I can manage your site, keep it backed up etc., and add an article or images, video or do whatever it is you need doing, for $75 per month. This covers an hour of my time to offer you assistance on top of the necessary allocated time for updates. Do you provide coaching? I need help! Once there you will see a login screen where you have to enter your username and password that I have sent you. Please copy and paste the password (as opposed to trying to manually retype it) as if you get it wrong more than 3 times you will get locked out! This is to prevent hackers from trying to login. If you are still having problems please send me an email and we’ll look into it for you. Do you have tutorials for using WordPress? Yes! All my clients are able to access video tutorials inside their admin dashboard, plus I have tutorials on my website too. If I don’t have a tutorial for what you need, I will either create a video to show you how, or give you step by step instructions. The only thing I don’t give free tutorials on is changing the web design. However, if you want to know how to change the fonts, colours, homepage banners etc., I am only too happy to show you how with one-on-one coaching. If you would like to use my WordPress coaching services, just contact me today to make a booking. What slider or gallery plugin do you recommend? I use the following plugins for creating sliders and galleries. How do I add more photos to my gallery or slider? Login to your website and look down the left hand side of your admin dashboard. Look for either Envira Gallery (for your galleries) or Soliloquy (for your sliders). To edit an existing gallery or slider, click Envira Gallery or Soliloquy. Once there choose the gallery or slider name that you would like to add your photo to. Before you begin uploading your photos, I suggest you resize them to no more than 1920px. If you look at the size of your images, they may be as large as 9000px. This can take a very long time to upload or worse, slow down the viewing pleasure for some of your customers/clients. They may have to wait if their computers are not the latest and greatest for your images to load! So once you have resized and are happy to upload the next thing to do is click the ‘Add Files’ button and browse to the photos on your computer that you want to add (you can upload multiple images at once). Choose the photo and click to begin uploading. Now wait while your photos get uploaded to your website (this could take anywhere from a few seconds to a few minutes depending on the quantity and size of your images). Once the photos have been successfully uploaded you need to click ‘Update’ so the changes will take place. If you forget, you will have to do it again! Your new photos have now been added to the gallery or slider you specified. To make a new gallery or slider, hover your mouse over and click ‘Add New’. You can copy the ‘config’ and other settings from one I have already done if you are unsure of what to do. How do I setup all my social media profiles? How to setup your social media profiles. How do I find the latitude and longitude for the Google map co-ordinates? Go to Google Maps: https://www.google.com.au/maps and type in your address in the ‘Search Google Maps’ section. On the pin location, right click and you will see a list as shown below. Click ‘What’s here?’ and at the bottom of the webpage you will see something like this…The numbers are your map co-ordinates. Make sure you keep the – in front of the Longitude figure and remove the comma. In any business, life is made easier with handy tools and resources. I am often asked what I use to either create a design or manage a certain area in my business, either for me or one of my wonderful clients. Therefore I have decided to share some of my favourite tools with you. Some of the links I provide are to free platforms, some are paid services and some of the links I may earn a commission for, if you decide to purchase. So now that I have provided full disclosure, I also want to add a disclaimer and add that the tools I use work for me and I can’t make guarantees on products or services I don’t own. Who do you recommend for getting beautiful fonts from? Dynamik For Genesis – I love Dynamik Website Builder by CobaltApps. If you are a total beginner who wants to be able to customize their website design (and don’t have any coding knowledge) or if you are a web developer looking for a design solution for your own web design and development business, then I recommend you look at the features of Dynamik Website Builder. You need the Genesis Framework to be able to use Dynamik, as Dynamik is a ‘Child Theme’ – but it is so much more than that! It is a website builder that has over 800 no-coding design options. If you already have Genesis and a Genesis child theme installed, but would like to make tweaks to your design, like a web designer would…then the Genesis Extender Plugin can help you. The Genesis Extender Plugin helps you take control of all the changes you would like to make to your Genesis Child Theme without having to hire a web designer or developer…or learning how to make code changes. This plugin helps you make changes to any Genesis child theme. I love Thrive Leads and it’s what I am using on this site. Thrive Leads is a new plugin that belongs to the creators of Hybrid Connect. Thankfully, Thrive Leads works on https sites (which is what this site is). It depends on my clients preferences basically and their sites SSL status. There are other differences in each, which I won’t go into explaining here, however right now I am using Thrive Leads and find it incredible for conversions…and it works perfectly on my SSL secure site! Have you been looking at the bar at the top of my website? You can have a message like this too. It is the WP Notification Bar plugin from MyThemeShop. HootSuite – There are many management platforms, but HootSuite is one of the most popular. There is a free plan and also a paid version which is very inexpensive. It costs just a few dollars a month and the time saved pays for itself very quickly. Schedule and automatically publish 100’s of messages. Manage and post to multiple social profiles all from one dashboard. Add up to 9 team members to your account, so you can have a social media manager and/or a VA to help with your scheduling.